Microsoft Word recognizes the spelling of Game of Thrones characters' names. 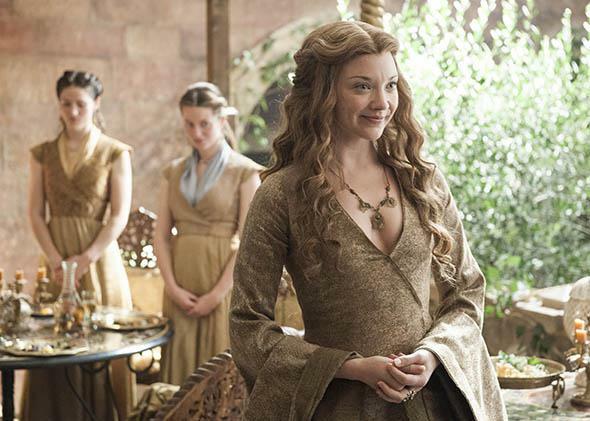 Natalie Dormer in Game of Thrones. Jon Snow may know nothing, but Microsoft Word knows more than you might expect. When Slate’s Jonathan Fischer sat down to write his review of the latest Game of Thrones season, he encountered an unexpected difficulty: It’s very hard to spell the name Daenerys. Worried that he wouldn’t notice if he got it wrong, he resorted to a manual solution. “I did a lot of copying and pasting Daenerys from my browser,” he told me. Microsoft Word's spellcheck seems to know all the names of Game of Thrones characters. Huh, who knew? Much the same is true for important characters from Star Wars, The Hunger Games, and even the Harry Potter franchise. As with Tolkien’s Lord of the Rings, Office’s spell check recognizes the names of some prominent characters from each while ignoring others. Like old Ben Kenobi, it has heard the name Obi Wan, but not that of his old foe, Count Dooku. Perhaps Microsoft—like most endowed with good taste—simply doesn’t acknowledge that the Star Wars prequels exist. It’s more difficult, however, to explain why it seems friendly with Severus Snape, but not with Harry Potter’s actual friend, Rubeus Hagrid. There are exceptions to the Game of Thrones rule: Characters who appear only in the novels still tend to get red-lined. Likewise, some place names (Meereen, Dorne, Yunkai, etc.) fail to appear in Microsoft’s dictionary. And for some reason the mysterious assassin Jaqen H’ghar goes unacknowledged, though that may be because “a man is not Jaqen H’ghar,” as he puts it. Nevertheless, the results are striking: You should be able to write your next episode recap with confidence. But prepare for trouble if, for some reason, you’re planning an essay on Lloyd Alexander’s Chronicles of Prydain. There’s one person who probably won’t benefit from this discovery: Game of Thrones creator George R.R. Martin. In a 2014 interview with Conan O’Brien, Martin explained that he still uses the late-1980s program Word Star 4.0 when he’s writing. “I hate spell-check,” he told O’Brien at the time. Perhaps Word’s surprising familiarity with Martin’s work is a quiet rebuke to his disdain. Glad you noticed that we are not just about common words. We regularly update the spellers to keep them fresh, including additions from the latest, most frequent names from movies, books, and TV shows. To do this, we research what people are talking about, what’s trending in the business world, current affairs, and other popular domains. We can’t add everything that comes up, so we reference different sources and determine which words to include. One of the 2014 lexical updates included the addition of characters from the Game of Thrones. Names relating to the TV show surfaced through several data sources which qualified them to be added. Up until 2014 we updated the English speller quarterly with 12,000 words added last year. Since January 2015 we’ve been updating the English speller on a monthly basis, and are on track to add an additional 32,000 words in 2015. *Correction, April 24: This article originally misstated that Tyrion Lannister’s lover was named Osha Shae. Her name is simply Shae. Osha is a different character. A graphic in the post also misspelled the name of Chronicles of Prydain character Eilonwy. The graphic has been updated.